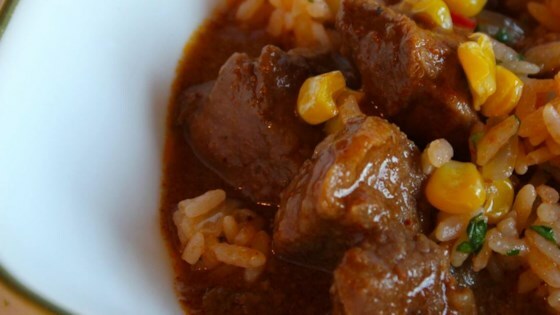 "This is a rich, mild chili and pork stew. It is one of my favorite things, which I like to eat from a bowl with plenty of saltine crackers and a salad on the side. It's also good served over rice or chili beans." Place 3 tablespoons flour in a plastic bag. Add pork and shake to lightly coat with flour. Set aside. Heat bacon drippings and vegetable oil in a Dutch oven over medium high heat. Add pork and cook until meat is evenly browned, about 5 to 8 minutes. Stir in 1 tablespoon flour, and cook 3 minutes. Stir in the onion, tomato sauce, chile powder, cumin, garlic powder, salt, pepper, and water. Bring to a boil, then reduce heat to medium low and simmer until pork is just falling apart, about 1-1/2 to 2 hours. Though I used cubed stew beef instead of the pork (I don't like pork), we all enjoyed this chili. I'll definitely keep this in my recipe box to make again. Thanks! This was very good. I used pork country stips because that was the only meat I had, and it turned out very tender. I like this recipe because it did not call for too many ingredients. I double the recipe.